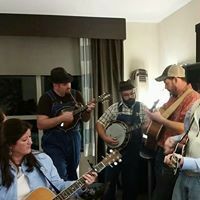 KY Fried Pickin' end of Winter Indoor Hotel Bluegrass Jam Festival (KFP) was put together in 2017 by Mark Hargis, Mark Royal, and Kristy Westerfield after learning that a favorite area hotel jam would no longer continue. Within two months this new event was put together; attracting pickers from 7 states and exceeding all expectations. This is the first official indoor hotel bluegrass jam festival in Owensboro, KY. The first year however did bring back memories from back in the day which bluegrass musicians from all over the United States would play in the Executive Inn during their stay for the International Bluegrass Music Association (IMBA) Festival when it was originally held in Owensboro. Musicians would gather all over the hotel each night after the festival concluded to jam and visit with each other. Hotel staff at the Holiday Inn were very accomidating to the KFP attendees. Not only was the hotel staff accomidating, but they had great hospitality that made bluegrass pickers feel welcome and wanted. Holiday Inn's General Manager Ruth Ann Dearness personally went be each room of jammer to personally thank them for coming as well as seeing if there was anything they needed. March 2018, the event's second year, was a sell out. Participants grew from 7 states to 11 states. Some came as far as California and Colorado. For KFP's second year we added a one mic band show case, which the crowd enjoyed. We are excited how event has grown from its first year and will add an early bird pickin' night on Thursday 14th in 2019. KFP has turned out to be a great jamming event with plenty of room to grow in Owensboro. Please follow us on Facebook to keep up with all the excitement leading up KFP 2019. One thing for sure, March 14th-16th of 2019 you will find a huge bunch of blugrass jammers from various states attending KFP, because it's finger pickin' good; so come on out and join right in if you pick -or watch if you do not. Col. Hargis has been passionate about traditional bluegrass for over 20 years. He is an expert in Monroe style mandolin and has been the band leader 17 years for King's Highway; based out of Henderson, KY. 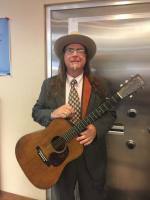 He is also the festival organizer for Bluegrass in the Park Folklife Festival. From heavy metal to traditional bluegrass; Mark's musical journey. This former rocker is knee deep in bluegrass, collects vintage instruments, and a proficient song writer. Royal plays in The Rosine Diner's Club and is an instructor for the Bill Monroe Mandolin Camp in Nashville, TN. Kristy, an accomplished bass player, has been playing for over 30 years. 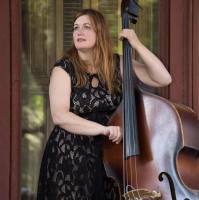 She is currently the bassist for King's Highway and works for the Bluegrass Music Hall of Fame & Museum. Playing is her passion and is always on the go with her bass Big Kay and Justine Tyme.